Green shading denotes the study area. In collaboration with Placer County and the Rails-to-Trails Conservancy, the City of Roseville completed a Planning & Feasibility Study for the Dry Creek Greenway West. Following a year of public input and analysis, this study evaluates the possibility of a 3 mile multi-use trail between Cook Riolo Road and Riverside Avenue. Factors such as creek location, topography, safety, aesthetics, and land use impacts were considered. This potential trail would ultimately connect with the proposed Dry Creek Greenway East (Riverside Avenue to Old Auburn Road), as well as trails west of Cook Riolo Road in unincorporated Placer County. The Dry Creek Greenway is just one of the trails in Roseville's Bicycle Master Plan and Placer County's Bicycle Master Plan. Subscribe to project updates and receive occasional emails or text messages. The Dry Creek Greenway West Planning & Feasibility Study will be considered at the following meetings. 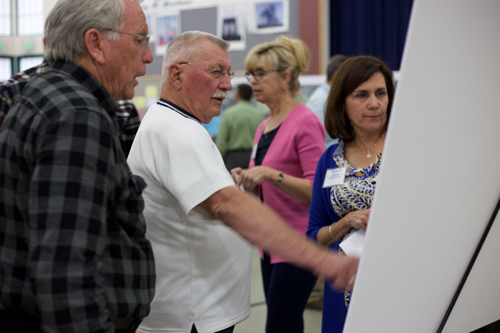 The second Dry Creek Greenway West Open House was held 6 - 8 p.m. on Monday, October 1 at Cirby School. The online workshop was open from October 1 - 19. More than 200 people shared their ideas. This valuable feedback is being considered along with other criteria such as creek location, topography, safety, aesthetics, and land use impacts. A draft study that includes preferred trail alternatives will be available for public review in early 2019. View a summary of public input. More than 50 people attended the first community open house at Cirby School on Monday, April 9. Ideas for the potential Dry Creek Greenway West multi-use trail are helping shape a preliminary plan. Paved off-street tails provide active transportation and recreational opportunities for people of all abilities. This potential trail would ultimately connect with the proposed Dry Creek Greenway East (Riverside Avenue to Old Auburn Road), as well as trails west of Cook Riolo Road in unincorporated Placer County. The Dry Creek Greenway is just one of the trails in Roseville's Bicycle Master Plan. Learn about the benefits of trails and greenways from the Rails-to-Trails Conservancy. The study of trail feasibility is considering emergency access, land uses, environment, clear boundaries between the trail and private property, connections to destinations, and other factors. Funding for the Dry Creek Greenway West Planning & Feasibility Study is provided by a Caltrans Sustainable Transportation Grant, Federal Transit Administration 5304 Grant, and local Transportation Development Act matching funds. You will have the opportunity to weigh in during a series of workshops, open houses, and virtual meetings. Subscribe to project updates by email or text message. All steps are dependent on funding availability.